Mary gloriously reigns as Queen of heaven and earth. Interestingly, in a religion that places so highly the reverence of relics (bones of the saints) there has never once been a claim by anyone to have the relics of Mary's body. This in itself is historical testimony to Mary's glorious assumption of her body and soul into heaven. Thus we read the picture book -- each picture teaching us something about the life of Mary, from her little girl days to her glorious reign in heaven. May our own life's picture book, the book that we write every day with our choices and actions, be as beautiful for God as was Mary's. 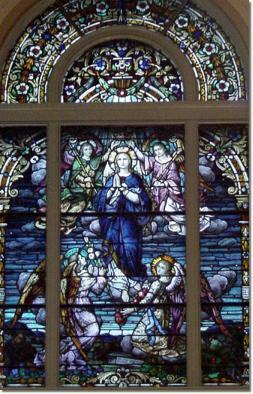 Our Lady assumed into heaven, pray for us.